I knew Levi really only through my husband Moishe, who grew up with the Deitsch family. On the few occasions that Levi came to Melbourne since he married Miriam, Moishe always loved to catch up with him, as old friends do. When we were overseas last year, Moishe went to visit Levi in Virginia. He could not get over the amount of people coming through the doors in the few hours they spent together. And although Levi did not look the same, he sure was the same Levi that Moishe knew and loved. Last year, my brother in law who is on Shlichus in Johns Hopkins University made a dinner for his community. Although unwell, Levi made the trip to Baltimore to be by the dinner, to support his friend and fellow Shliach. After the dinner, Levi called our house. He wanted to give Moishe Nachas from his younger brother, and proceeded to talk of how impressed and inspired he was by my brother in law's speech. 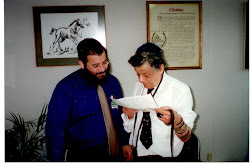 As I spoke to Levi, I could not get over that with all that was going on in his own life, it was important to him to think of Moishe in Australia, to call him to give him Nachas. On a personal note, I was humbled at how Levi spoke so warmly to me, as if we knew each other personally. As we chatted, I could not get over how this sick man sounded so cheerful, so full of life, so happy. This was Levi. After Pesach this year, I wrote an email to Mendy, Levi's brother, to tell him how we had spent Pesach with a bochur from his community, and how the Bochur had such wonderful things to say of Mendy. Literally as I pressed the send button, my American phone rang. The caller ID showed Levi Deitsch. I was shocked. When I picked up the phone, Levi in his ever so friendly voice told me he was sitting with his brother Mendy, and they were talking about Moishe, so they decided to call to say hello. We spoke for a bit and then he asked for Moishe's work number. When he got through to Moishe, Moishe was so touched. He put everything at work on hold, and spent some time Shmoozing with his dear friends. Levi's passing has left Moishe and myself with broken hearts. We are aching for Miriam and the children, for Cyril, for all the Deitsch family. And we are aching for ourselves as we have lost a dear friend. I am honored to have known Levi, even the little bit that I did. And I am a better person because of him, for the Hachlotos that I took upon myself in his Zechus. Miriam, I wish you strength to be able to cope with this, and may you be comforted from hearing of all the many people Levi touched. May you always have an abundance of Nachas from your children, and know of no more pain!